So many people have asked me how to set up a plant-based (vegan) pantry that I decided this subject merits a permanent place on VegKitchen. 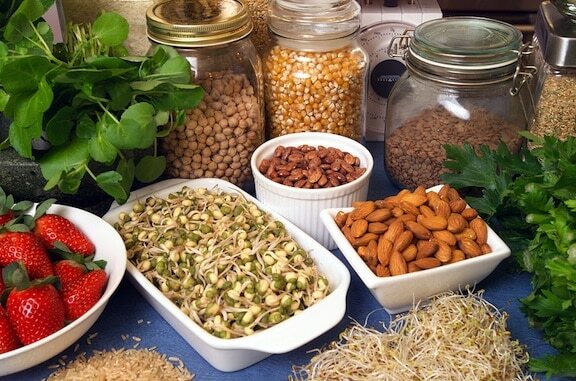 Whether you are a newcomer to a vegan/vegetarian diet, or someone who wants to have a greater variety of healthy ingredients at hand, this list can serve as your handy guideline. Now, no matter how time-crunched life gets, you can be sure that a healthy, nearly effortless meal awaits at the end of the day! Of course there are other items you might like to keep on hand, but these are the basics that are my household staples. Though fresh produce counts as staple food, it would be cumbersome to list everything I keep on hand here, so for more info on keeping your fridge stocked, go to Stocking Your Refrigerator for Everyday Healthy Meals. Produce is the food I shop for most frequently, since I like to have it as fresh as possible. Though the seasonality of produce has been stretched by imports, I like to stick with what is truly seasonal as much as possible. Please support family farms by shopping at local farm stands and farmers markets if you have access to them. Cast a vote for organic produce and buying locally when you can. If you’re inclined to cook beans from scratch, so much the better. Black beans, adzuki beans, and navy beans are particularly good cooked from scratch; there’s also pink, kidney, red, and large white beans; brown and red lentils, and split peas. 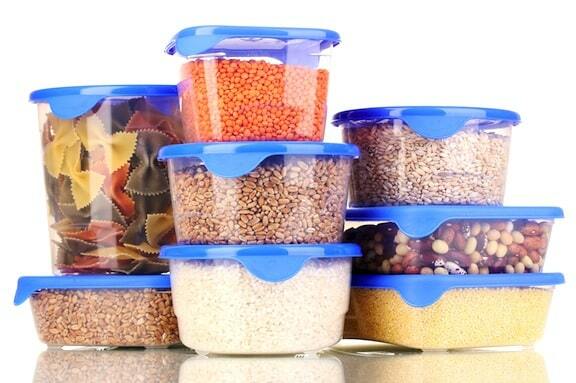 If you store whole grains at room temperature, don’t buy more than what you will use up in about 3 months. During hot summer months, refrigerate them—especially flours. Keep a good range of commonly used varieties on hand; seasoning blends, especially an all-purpose salt-free herb-and-spice blend, a good-quality curry powder, as well as an Italian herb seasoning blend, are especially useful. 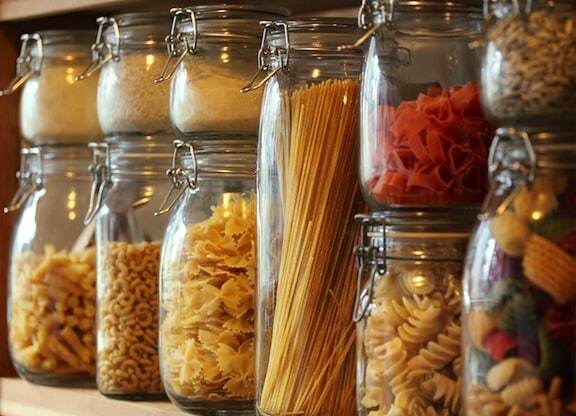 Keep a good supply of different sizes and shapes of pasta in your pantry. Some useful shapes to have on hand include angel hair, thin spaghetti, spirals (rotini), ziti or penne, fettuccine, and linguine. Asian noodles, such as udon, soba, rice noodles, and bean thread noodles, are available in natural food stores and well-stocked supermarkets, are nice to have on hand as well. Keep what you like on hand from among peanuts, cashews, almonds, walnuts, pecans, sunflower seeds, pumpkin seeds, and sesame seeds. 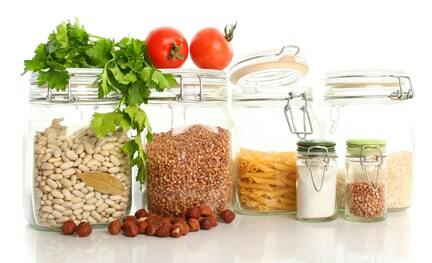 All nuts and seeds should be kept in the refrigerator during the summer as they will go rancid otherwise. Chia, hemp, and flaxseeds should always be refrigerated. As far as nut and seed butters, choose from among natural, organic peanut, cashew, almond, sunflower, and tahini (sesame paste). Buy a good natural brand for best flavor. Some people prefer the milder taste of Bragg’s Liquid Aminos. Any tips for storing/stocking items such as tofu, tempeh, seitan? Clare, no special tips other than to refrigerate and to pay attention to the “use by” date. I just buy those items on an as-needed basis. FYI, soy sauce and tamari sauce are not the same thing. Soy sauce is much heavier and tamari is a delicate seasoning. had to order case (#6) at once. It kept very well in the refrigerator, even past the sell by date. ( On other hand, I would not buy from store if already past dates). I do not always use the whole block at once, so after open plastic wrap, put remainder in a container and cover with water. Change water every day and keeps well until next recipe. This is how we used to store tofu bought when shopping at co-op 30 years or so ago. If I’m not going to use tofu right away, I freeze it. I prefer the texture after it has been frozen and thawed. Freezing and then thawing tofu (and then squeezing out the water) does give it an entirely different texture, which some people prefer. For those who haven’t tried this, it’s kind of crumbly and chewy rather than mushy. If you incorporate it into saucy preparations, it absorbs flavors even more so than tofu straight out of the container. This is a great list. I am starting a 30-day vegan trial on Monday. I am setting a short-term goal for myself because I am currently an avid consumer of animal products. I want to be healthier and kinder to the planet, but I need to ease into it. This is such a great list to get me started, and doesn’t seem like it will be too expensive. I’m glad this list is helpful to you, Jessica, and I wish you all the best in your 30-day vegan trial. Whether you go on or not, I hope you’ll come back to VegKitchen for lots more tips and recipes. To add to the tofu list, buying silken is a great idea as well as the firm. Silken makes a creamy addition to sauces and smoothies as well. I also love using TVP and Seitan. I suggest buying the TVP from May Wah in New York. They make it in thick beef like slices and when you marinate it in Soy or Veggie Bullion mixed with corn starch and sear it, it makes the best bar-b-q beef-like sandwiches ever!! If anyone knows who sells TVP like that on the west coast please post! Jack, you’re right, silken tofu should be on this pantry list, since it can be stored at room temperature. I’ll add it, thanks! Hi. I am leaning toward a more plant based diet. I am so overwhelmed by everthing I am reading though. I have read that some sugar is filtered through bone char. So doesn’t most bread and pasta contain sugar? I want to eventually eliminate all animal product out of my family’s lives but the more I read it almost seems impossible. Any suggestions would be appreciated! Most pastas do not contain sugar, and good whole grain breads do not and should not. I think that after reading the above article, you’ll see that avoiding sugar refined with bone char (an insane idea in the first place!!) is not too difficult. I hope you all know that tofu is soy and it damages your thyroid. Do some research. It is terrible for someone with Hashimoto’s disease. Fermented soy like soy sauce is ok. Thank you for providing this clarification, Susan. What a great comment, Jamie! Thanks, and good for you and your wife! Please join our FB page for easy ideas every day: https://www.facebook.com/VegKitchen — though you’ll need to remember to check in once in a while, as FB has gotten very stingy on showing pages people like in their feed. My husband has been diaognosed with prostate cancer and I am starting our family on a vegan life style for him. Does anyone have any tips for me in this area? Anything would help, Thank you so much! Best of luck to you and best of health to your hubby! I read that fermented soy is okay. Can you enlighten me please? Thanks for the guide, Susan! Have You tried goji berries? They contain very little sugar and a lot of antioxidants. You can have them with oatmeal. Thanks for sharing, Susan! Not completely a vegetarian myself but try to keep my food healthy. Thanks for the post and for the advice! 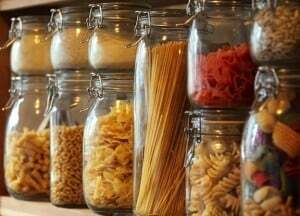 Firstly, let me just say that I love how you have outlined a list of pantry items for those who are looking into becoming vegan, and for those who have already begun their journey. I would like to share some advice, primarily for those who are adopting a whole foods plant-based lifestyle. 1. Do not, not now, not ever, think of this as a diet. It is, indeed a lifestyle. 3. For those who do not know, the difference between soy sauce and tamari is that tamari is gluten free and soy sauce is not. So, for those with gluten sensitivity, you will want to purchase tamarin. Once more, I applaud you and appreciate what you are doing for those who are transitioning into a whole foods plant-based lifestyle. Thank you so much for your valuable insights! I was never sold on coconut oil. I do use just a tiny bit of olive oil here and there, mainly for flavor. And I agree, being vegan is a lifestyle, as well as a cherished value. Just to let you know, couscous straddles the line between grain and pasta. It’s not made with a dough so it’s not actually pasta, but it’s not just a grain on its own, it’s moist semolina mixed with flour. It’s up to you if you want to change where it’s listed, but I just thought I’d bring it up. This is a very good point. It’s always tricky to know where to place couscous! Great list! Very helpful for the likes of me: I am currently on a juice fast and I want to move to an all plant based diet. It’s going to amaze everyone around me because I’m such a carnivore (tartare is my thing…) so my biggest problem is know what I’m doing in terms of cooking vegan long term and in a sustainable way that I can integrate in my life and follow long term. I’m going about it tentatively by integrating more and more plant based dishes (my big issue is eggs and cheese -I’ve solved the cheese one but not the egg issue …quiches? How to do quiches? I have a few eggless tarts I know but it reduces options…) so I’m not sure it’ll work 100% yet but I feel so much better since I started that I’m in full on research mode! Thanks again! Wonderful, so much appreciated, you do such good work, glad I found you – will keep you – your writings and talks. I have psoriasis and am changing my diet to better my immune system… I’m overwhelmed. The food lists I have found suggests only veggies fruit and meat…. I would like to stay away from meat as much as possible (after watching forks over knives)….. do you have any suggestions?